The UNODC (United Nations Office on Drugs and Crime) on 31 July has signed an agreement with the Ministry of Home Affairs (MHA) to fight against human trafficking prevailing in the country. The UN women in India and the UNODC joined hands on the eve of World Day against Trafficking in Persons (30 July) to come across the battle of human trafficking prevailing in the country especially in the borders. 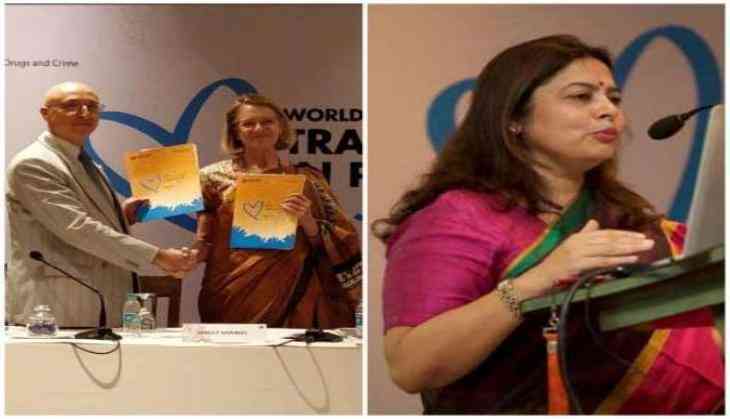 Addressing the press conference, Member of Parliament Meenakshi Lekhi told media, "The major drawback of any country to deal with human trafficking is the poor economic condition of that country which forces people to indulge in such type of malpractices." "I am happy that the UNODC has taken the initiative to rehabilitate the victims of trafficking from the perspective of law and enforcement," she added. An event 'Blue Heart' was also organised on the occasions. The event focused on the protection following prevention of the victims in the trafficking. The even claimed that the human trafficking was mainly seen in the border areas of India-Bangladesh border and India-Nepal border where people are forced and pressurized to surrender for human trafficking in the name of migration and fake commitments. Brig. Gen. Md. Mahfuzur Rahman, Additional Director General, Border Guard Bangladesh, said, "It is a very serious issue but the Government of India and security forces of India and Bangladesh are jointly working to control these types of trafficking cases." He further said that the UNODC South Asia assists Bangladesh, Bhutan, India, Maldives, Nepal and Sri Lanka to develop comprehensive and sustainable responses to trafficking in persons. He added that such responses include prosecution of perpetrators, protection and assistance of victims and, most importantly, prevention measures. India vs Windies: फाइनल मुकाबले से पहले जान लें ये अहम बातें, इस खिलाड़ी की हो सकती वापसी !